Figure A. Alexa Fluor 700 conjugated Mouse anti Human CD19 (MCA1940A700) and FITC conjugated Mouse IgG1 isotype control (MCA928F). Figure B. Alexa Fluor 700 conjugated Mouse anti Human CD19 (MCA1940A700) and FITC conjugated Mouse anti Human CD80 (MCA2071F). All experiments performed on Daudi cells gated on live single cells in the presence of 10% human serum. Data acquired on the ZE5™ Cell Analyzer. CD80 is a member of the immunoglobulin superfamily having an extracellular domain bearing both a single Ig-v-like domain, a single Ig-c-like domain, a transmembrane sequence and a short cytoplasmic domain. Although the predicted molecular weight for human CD80 is ~33 kDa, the presence of multiple (8) potential N-glycosylation sites (Chen et al. 1998) results in a migration corresponding to ~60 kDa. Human CD80 along with CD86 act as co-stimulatory molecules and are both ligands for CD28 and CTLA-4 (Azuma et al. 1993) involved in T cell activation and proliferation (Vasu et al. 2003). Although CD80 binds to the same receptors as CD86 it displays quite different characteristics in its avidity and binding kinetics (van der Merwe et al. 1997). Site mutagenesis studies indicate residues in both the Ig-v-like and Ig-c-like domains of CD80 are crucial for the interaction with it’s receptors CTLA-4 and CD28 (Peach et al. 1995). Mouse anti human CD80 antibody, clone MEM-233 binds to residues within the Ig-v-like domain of human CD80 as shown by domain switching studies (Vasu et al. 2003). 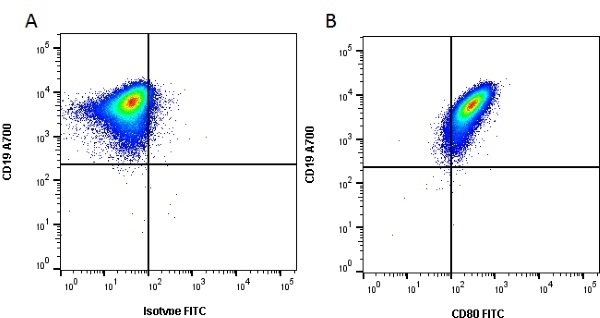 Functional studies using Mouse anti Human CD80, clone MEM-233 in combination with Mouse anti Human CD86, clone Bu63 (MCA1118) suggest that clone MEM-233 is able to block binding of human CD80 with it's cognate ligands CD28 and CTLA-4 (Morbach et al. 2011). Storage in frost free freezers is not recommended. Should this product contain a precipitate we recommend microcentrifugation before use. Zhan, H. et al. (2003) The immunomodulatory role of human conjunctival epithelial cells. Invest Ophthalmol Vis Sci. 44 (9): 3906-10. Angel, C.E. et al. (2006) Cutting edge: CD1a+ antigen-presenting cells in human dermis respond rapidly to CCR7 ligands. J Immunol. 176 (10): 5730-4. Aotus nancymaae, a non-human primate model for biomedical research. Vet Immunol Immunopathol. 119 (1-2): 14-20. Hovden, A.O. et al. (2011) Maturation of monocyte derived dendritic cells with OK432 boosts IL-12p70 secretion and conveys strong T-cell responses. Piconi, S. et al. (2010) Immunological effects of sublingual immunotherapy: clinical efficacy is associated with modulation of programmed cell death ligand 1, IL-10, and IgG4. Scheinecker, C. et al. (1998) Initiation of the autologous mixed lymphocyte reaction requires the expression of costimulatory molecules B7-1 and B7-2 on human peripheral blood dendritic cells. Tan, P.H. et al. (2005) Modulation of human dendritic-cell function following transduction with viral vectors: implications for gene therapy. Trojan, J. et al. (2010) Antisense anti IGF-I cellular therapy of malignant tumours: immune response in cancer patients. Huxley, P. et al. (2004) High-affinity small molecule inhibitors of T cell costimulation: compounds for immunotherapy. Tan, P.H. et al. (2004) Phenotypic and functional differences between human saphenous vein (HSVEC) and umbilical vein (HUVEC) endothelial cells. Scott-Taylor, T.H. et al. (2017) Enhanced formation of giant cells in common variable immunodeficiency: Relation to granulomatous disease.